British publication Business Insider has revealed the most unusual and beautiful places where weddings can be held. Bora Bora underwater chapel and the small village of hobbits in New Zealand are just some of the dreamlike locations listed. Every couple wants to have a special wedding and memories that must remain embedded in the heart for life. Although most of them are likely to adopt the classical style choosing a celebration on a restaurant, there are new places that can changes a great event in a true story. The British publication Business Insider has made a top of the original and beautiful places where weddings can be held. On the top there is Chapel of the Wieliczka Salt Mine in Poland. 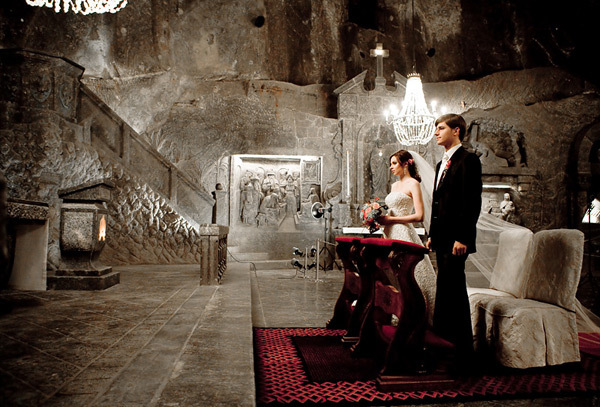 Located on the outskirts of Krakow, the Wieliczka Salt Mine in Poland can accommodate large parties, as the location is very spacious. Legend has it that long ago a Hungarian princess named Kinga, while on honeymoon with her husband, Count Boreslaw threw the engagement ring in a salt mine. Once in Poland, Princess commanded Wieliczka miners to dig a pit in the ground. In the first lump of salt brought to the surface it was discovered the ring of Princess Kinga. In the ninth century, in the mine there was dug a chapel in memory of Princess Kinga. Hobbiton, the small village of hobbits in New Zealand offers an atmosphere worthy of the trilogy "Lord of the Rings". Guests can be served with canapés and champagne in the garden or can be invited in Manor Green Dragon, serving menus consisting in special dishes such as lamb encrusted with rosemary. Although the land was originally arranged as a movie set and not as a tourist destination, with the completion of filming was decided keeping the scenery for tourists. 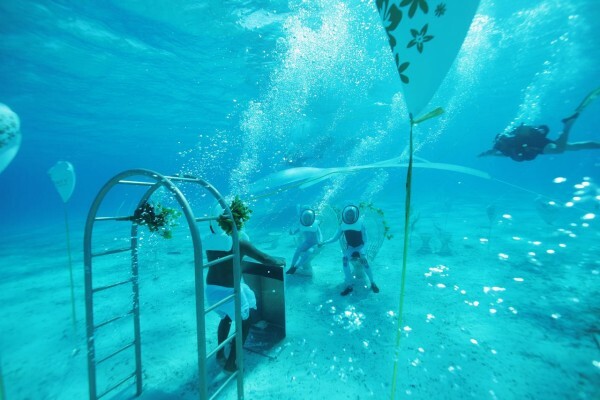 The underwater chapel in Bora Bora is the right place for seaside lovers. Couples can wear white suits, which would highlight when swimming through the blue lagoon. They will be greeted by a Polynesian priest in charge of such ceremonies. They can even bring up their friends to attend the happy event. Christy P Wilson always dreamt of having the perfect wedding, but in the most unusual manner. So, when her fiance, Joby K Joy, arranged a beach destination as the place to say their wedding vows, her heart skipped a beat. The location was ethereal and straight out of the movies. “He wanted this to be a surprise for me. It was only when I arrived for the wedding that I realised this was where we would be wed,” gushes Christy, even as she describes how the beautifully decorated altar, decked in blue and white, had transformed the otherwise crowded Kollam beach to be the perfect wedding destination. 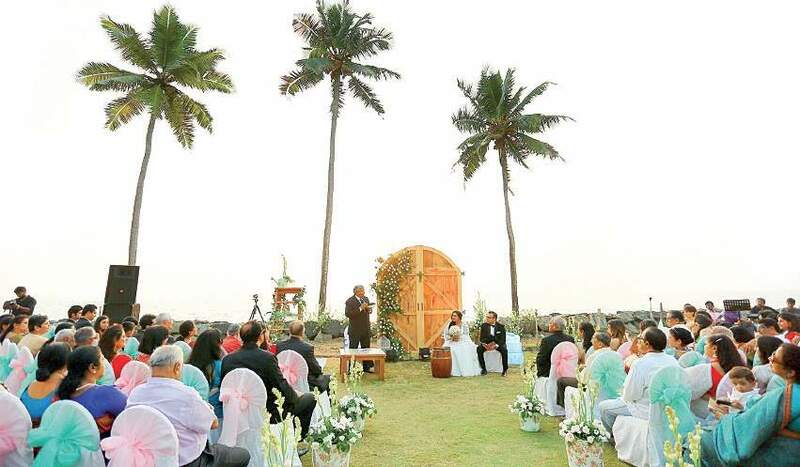 Owners of Jo and company, the event managers from Thiruvananthapuram, who conducted the wedding claim that this was the first time that a beach wedding was held at Kollam. However, the trend has already caught on in bigger destinations like Kovalam, Varkala, Vypeen and Cherai beaches. “So far, we have done over 10 beach weddings during the past two years. What is attracting youngsters to the idea is the ambiance that it provides. Secondly, they believe it will make the perfect photography material,” shares Greto Chacko, the Kochi-based manager at Lumier Wedding Company. The weddings are often held during the sunset and early mornings, to provide the perfect aura. There are other reasons why beach weddings are only gradually making its grand entry to Kerala. “Beach weddings are a Western concept, where the bride and the groom hold a closed ceremony attended only by friends and immediate family. But, in Kerala, nobody, especially of the older generation, can think of restricting the crowd to just a 100 or 150 guests. If a marriage or a reception has to be held at a beach, limiting guests is a priority,” adds Greto. Sofia Mathew, director, weddings at Watermark says that beach weddings could be the most challenging for planners. 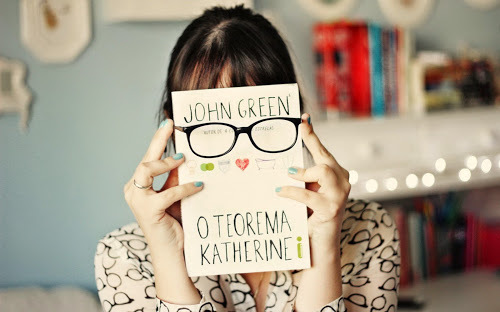 “Nothing is really in our hands. The wind could be too strong or the weather difficult. But making the arrangements is unique, as it requires decking up the altar for Christian marriages and mandapams for Hindu ceremonies. The aisle and the chairs are also decked up to lend in a special feel,” Sofia added. Most of Sofia’s clients have been foreigners and North Indians who prefer destination weddings in the backwaters and on beaches. 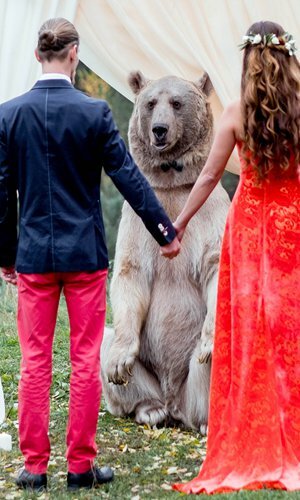 A couple in Moscow had an unusual special guest at their wedding ceremony. 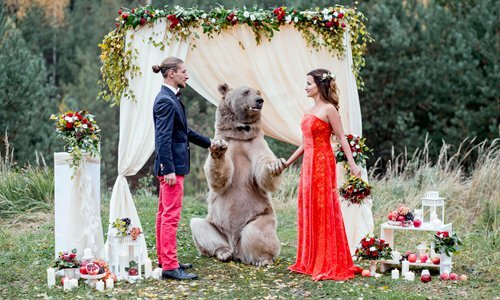 The bride and groom invited a brown bear named Stepan to witness their exchange of vows, and even took a picture with the furry guest during the ceremony. Wedding certainly special affair and even in several years ago, people used to program and prepare its dresses taking months together. These were the days when using formal traditional wedding dresses was almost mandatory. However with change in lifestyle and also people's attitude towards cultural ethos, formal bridal dresses are gradually receding thus the the next generation casual wedding dresses. Shifting of marriage site from churchyards to patio has also contributed greatly around encouraging using casual wedding event dresses. If you are planning to solemnize your much awaited bridal ceremony secretly in an isolated region, will you bother to go with the minute details of a formal nuptial? Collecting short informal dresses will certainly be your first liking then. Such informal dresses have their inherent advantages in excess of their counterparts. Opportunity of earning one's own personalized wedding event dresses also exists along with the casual wedding attires. Looking at great potential, designers plus manufacturers are also now days chaotic developing exotic and exciting casual marriage dresses. To match the place of celebration, aspect and design of your relaxed wedding dresses should be opted. Marriage at one's private backyard with complete relatives gathering requires sober plus decent dresses. If it is your hot summer evening, you mustn't choose something that may help people sweat further. A nice creator strapless may fulfill your individual requirement. You may also go for masturbators, if you feel uncomfortable with the bustier exposures. A square or maybe v-shaped neckline may be decided to suit your taste. With laid-back bridal dresses, there occur actually unlimited options to decide on ideal marriage attires. Several very common examples of informal marital life outfits are halter neckline, designer silhouettes, sleeves, waist lines, skirts with matching overcoats, bridal trains, etc . Casual wedding dresses provide an fantastic opportunity to stay in touch with the latest the latest fashions. Splendid embroidery works along with fabrics generally form section of such informal nuptial costume. Design of these works can be ordered or can be ideal chosen to suit one's individual personality and budget. For anyone who is searching for a perfect beach bridal dress, you may go for white colored limited skirt. In such cases, you must not miss to collect appropriate veils, shades, hair bands, and boots, etc . In other spots, your wedding accessories may differ, nonetheless they must not be ignored. Else, your own personal informal wedding attire on your own will not be able to prepare you exotically for your partner. Casual wedding dresses are very common to the people who always want to build uniqueness in their every globe of activities, or for second or third marriages. Though white and cream color are the two prominent colorations for most of the informal wedding event dresses, but you have the 100 % liberty to choose pink, yellow hue, green, red, etc . like favorite colors for your goal wedding attires. As these dresses have very limited after apply, you most not buy costly deals. After a littler search at your local établissement shops, departmental stores, or simply in various online virtual retail outlets, you will be able to locate fabulous relaxed bridal dresses within cheap prices. If you have enough times existing, you may search for discounted dresses. On the other hand, if you have little time, perseverance, creativity and intention, people yourself can design stunning personalized casual bridal dresses. Currently, modern brides are genuinely blessed because they have an alternative not to wear heavy and also formal gowns by choosing any beach themed wedding. In this particular type of wedding, brides need not worry about choosing a formal outfit because they can only wear any beach wedding dress. Indeed, in all of the modern day concepts of wedding, seashore theme is one of the most popular. For this reason popularity, a beach wedding dress has changed into a common option for this styled wedding because they are easy to pick and to carry. For most birdes-to-be, a beach wedding dress is the most ideal wedding dress because it demands lesser time in finding things to wear for the occasion. Simply because they can save time, brides who also prefer wearing a beach wedding dress can have more time to program and carry out details of the entire service. Aside from being hassle free, any beach wedding dress is also ideal as it can provide you with utmost comfort within this stressful time. It is also cheaper compared to the traditional wedding dresses out there because a beach wedding dress typically appear in simple cuts and styles meant for the location. Also, purchasing a beach wedding dress, make sure that this is certainly designed to cling to the shape of your body. A beach wedding dress should be pared down and also slim fit to ensure that you will not be distracted once the breeze caught the hem or any type of part of your dress. 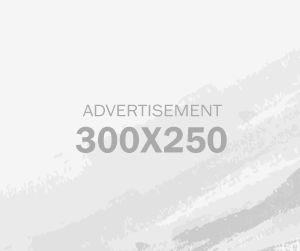 Excellent options for a beach wedding dress contain straight-line wedding dresses, mermaid cut wedding dresses and people that are princess line slice to ensure that you can move concerning easily. Aside from portability as a result of use of lightweight material, in addition make sure that the beach wedding dress put in at home to transport by avoiding a lot detail or accessories in it. Although it might appear easy, there are also major for you to when you choose a beach wedding dress. The primary major consideration in buying a wedding dress should be the crissis of the destination. Determining often the climate is very important because this is affected by your overall comfort during the wedding. Make sure that you have checked together with the local weather station branch the normal climate for the area previous to setting your final wedding date. If the area is definitely rainy or prone to hurricane, it is best to look for a beach this in a tropical country the fact that weather would not ruin your personal date. Next consideration certainly is the average temperature. If the beach the place that the ceremony will take place was in a tropical country including in Boracay, Philippines, pick a beach wedding gown that is definitely made cotton or an issue that will let the air move through. Aside from the material used, in addition choose designs that will help you breathe from the harsh heating of the area. Ideal slices are sleeveless, tube, bustier, or off-the-shoulder ones since can give you ultimate comfort even with direct exposure to the beach. Any type of fabric is also a big account. If you are choosing a beach wedding dress for ones big and special day, be sure that you opt for those that are types and cuts made from material that are lightweight such as organza or chiffon. This will be sure that you will be comfortable despite the hard winds and heat with the beach. 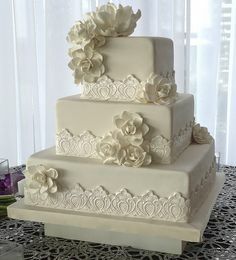 The bottom tier is a rich fruit cake and the top tier is vanilla sponge; however you do have the choice to make both tiers vanilla sponge should you prefer. 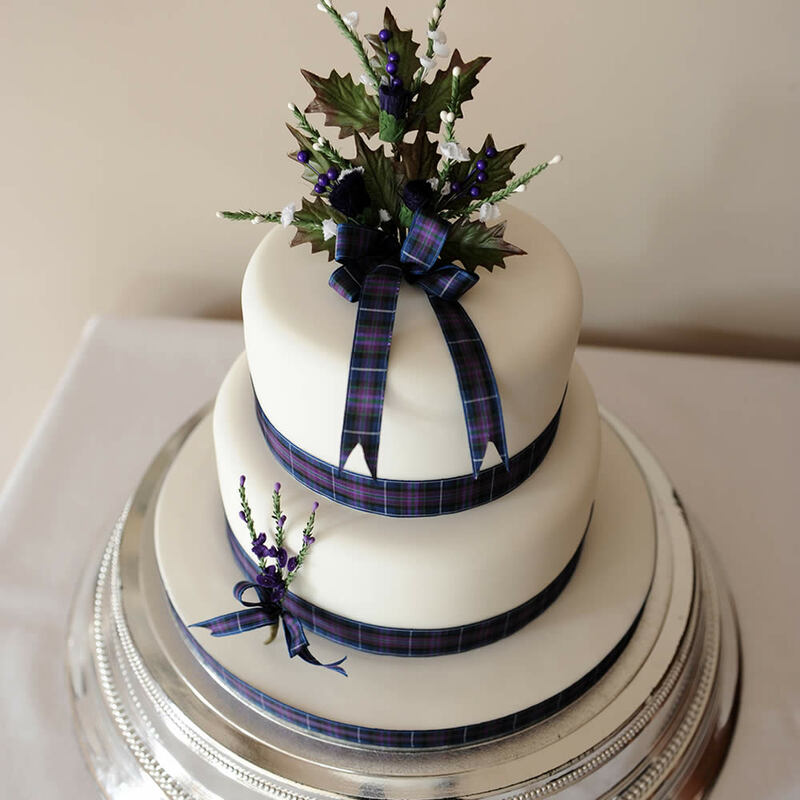 The decoration of this lovely two-tier wedding cake is based on a Scottish theme... the cake topper is made by hand from a variety of silk floral elements, including thistles, heather, ivy leaves, rosebuds and bows of purple organza ribbon. To finish the decoration process both tiers are wrapped with a 1" wide tartan ribbon. Once coated with marzipan and icing, the cake dimensions are approx. 8 ½" diameter x 2 ½" high for the bottom tier and 6 ½" x 2 ½" for the top tier. The cake is then mounted on a coated ½" thick cake board and finished with a picot-edged satin ribbon. Two persons decide to bring together at one point of your energy because they have love going in their relationship. They prefer to take a small step ahead of time, get married and have a restful life. They promise to share with you all the sorrows and delight that they face in life. This kind of occasion needs to be celebrated using love and affection. Some sort of wedding cake is a symbol of enjoy which is bright and vulnerable. Love is strong which will withhold any problem with its electrical power. 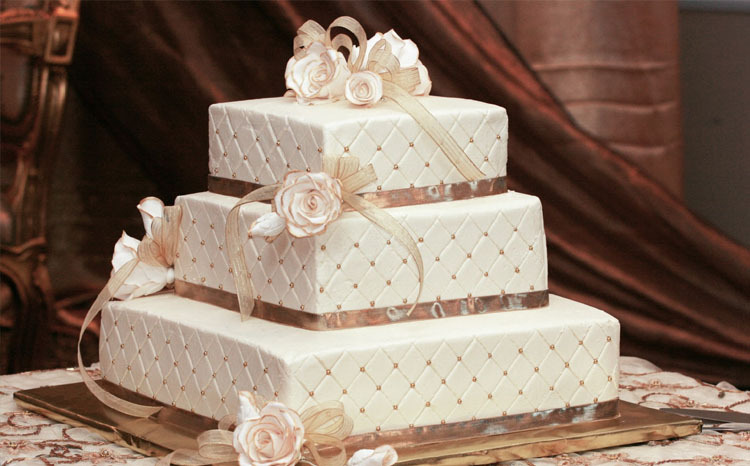 Having a square wedding cake intended for celebration is the perfect plan to enjoy the committed lifestyle ahead. Design of the square cake should be replica on the couple which is getting married. It may have ingredients which complement the tastes of the committed couple. There are different patterns that can be selected on a square cake. A square wedding cake has that classy look which can be replicated while using couple. The cake rips off the attraction of the group when they enter the hall or maybe arena. You can select the coloring and design of the cake according to your needs. Some of them get flowers with floral patterns in the background. Some of them are several tiered cakes. These are a number of designs that are usually witnessed in cake. It is solely your choice to decide which one will fit the bill. When it comes to flavors the list maintains going on and on. You might get baffled as to which flavor will certainly suit and taste greatest. Chocolate, pineapple, vanilla, blood, black current, white spread and fruit cake are a couple of the flavors available. Choosing the flavor according to your preference will make the day special. Right now after the cake's flavor is actually chosen, you can decide concerning the external designing of the cake. Ribbons and flowers could be kept as bordering. 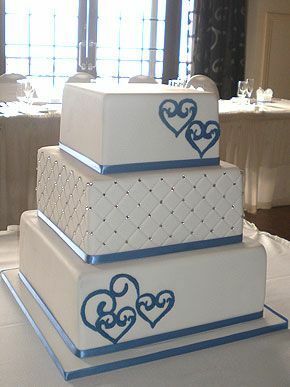 You are able to border the cake along with motifs and special goods that are close to your cardiovascular. Square cakes are favored by those who wish to have the royal wedding with easy taste. Multi layer cake can be one of the designs which can be selected for wedding. You like a wedding because it is a meeting where two souls fulfill. Therefore the design and taste should be unique. For flavor you can even choose different mixture of flavors. Color schemes are also accessible. The color will be according to your decision but the flavor should match up the color. In multi split cake you can keep one coating in butterscotch and the some other in chocolate. This is among the recent traditions which is implemented for royal square cake. Even you can select the colour of the cake according to location arrangement. If you have selected a specific floral theme you can get the colour of the cake according to which color. The design and colour of that cake will increase the interior look of the location arrangement. However you must what is price of square wedding cake before placing the order. Such situations you might have to spend additional. But ordering from a real store at the right cost will help a lot. You need to make certain the flower arrangement along with theme of the venue needs to be according to the design of the cake. This will make the moment quite special and memorable for yourself.